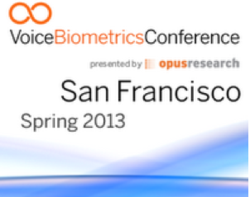 Opus Research will hold its 9th Voice Biometrics Conference on May 8-9, 2013 in San Francisco. The conference serves as a function to show applications for voice biometrics, and executives from industries utilizing voice biometrics share lessons learned in the deployment of this technology. Planned discussion topics include replacing passwords, fraud profiles, securing personal virtual assistants, accuracy, multi-factor authentication, passive enrollment and authentication, embedding voice biometrics into devices, compliance and case studies. The conference is geared toward industry providers, integrators, implementers and executives across a wide variety of fields that use voice biometrics.